What makes a high quality cutting board? 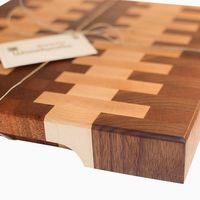 A cutting board is an essential tool in any kitchen, a great gift, and a beautiful piece of home decor. But with so many different styles and materials (and such a wide range of prices), how do you know what type of board is right for you? 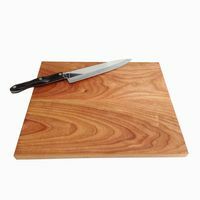 High quality hardwood cutting boards remain the gold standard for everyday kitchen use. Compared to plastic boards, they are more durable, easier on knives, and the more attractive for serving and kitchen display. Hardwoods we recommend include Maple, Walnut, Cherry, Beech, Mahogany, Sapele, and Oak. Bamboo, technically a grass, is harder than most hardwoods and is a durable and environmentally friendly choice. Generally, we don’t recommend softwoods, like Pine, Fir, and Spruce - they just don’t stand up as well to years of cutting. We always recommend that you use wood for your primary serving and cutting boards, but a cheaper plastic board is good to have on hand for cutting raw meat. That’s because plastic is heat and moisture resistant enough to be put through the dishwasher for thorough cleaning. Be careful - once a plastic board develops deeper cuts, it’s time to replace it. Those cuts can snag your knife and provide a place for bacteria to hide out. Grain configuration can be confusing for the novice buyer. Generally, if you’ve chosen a hardwood, you can’t go wrong - but experts appreciate the nuance between the different styles. 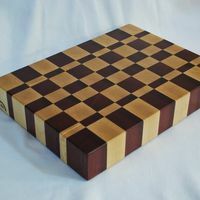 The “checkerboard” look of an endgrain board also makes for an attractive look that can be displayed in low, medium, or high contrast. Edge grain boards are made by facing the long narrow edge of the board upwards, fusing together a number of narrow sections together with glue. The grain that is exposed is the grain that you would see by cutting a tree vertically (top to bottom). Edge grain boards provide exceptional durability and are great at withstanding warping or cracking from moisture. They wear a bit harder on knives than end grain board cutting boards or butcher blocks. 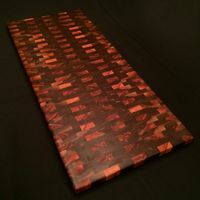 An edge grain board can also feature a range of designs, as strips of different colors and grains of wood are layered together to form a beautiful pattern. Pros: Durable, clean look, great for laser engraving, most affordable. Side or Face grain boards expose the wide face of a typical board cut, providing a clean expansive look. The blank canvas of a side grain cut of a lighter hardwood like Maple is ideal for engraving as it provides a large, open surface to showcase a laser-engraved logo, monogram or other design. 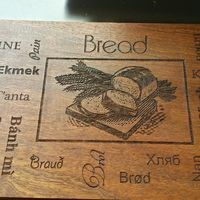 Personalized and engraved cutting boards are very popular gifts, offering a personal touch for a wedding or housewarming present. Face grain cutting boards are typically made from a small number of boards, often just 2 or 3. These boards offer limited thickness, since they typically reflect the thickness available in raw lumber. 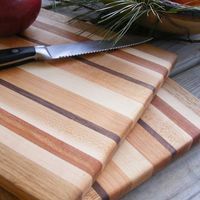 If a 2-3 inch butcher block style cutting board is what interests you, you’ll need to look to edge or end grain boards. So what’s all this about butcher blocks? Butcher block refers to a style of wood product, now commonly used for cutting boards, countertops, decoration or heavy duty chopping blocks. Until relatively recently, butcher block was most commonly used in the construction of heavy duty chopping blocks used in butcher shops. The style has become much more popular in recent years and is now commonly used for countertops as an alternative to granite or stainless steel. In the cutting board space, butcher block is a bit of a vague term. 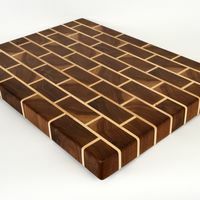 Butcher block cutting boards are usually thicker, end-grain boards, featuring the checkerboard-style design that’s typical of end grain cutting board assembly. 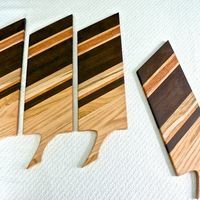 These cutting boards are most commonly 2 or more inches in thickness. Of course, true butcher’s chopping blocks are still made and can be used as a great prep surface in any kitchen. Live edge, spalted maple, and salvaged scrap wood serving boards. 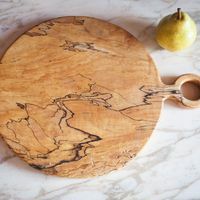 In the hands of a craftsman, a board can be designed to showcase the natural beauty of a piece of wood, and make for a beautiful serving board or cheese board. These boards are typically designed for display, and should be selected based on aesthetics rather than the durability or use as a cutting surface. These may be single slabs of wood, featuring the live edges of the tree from which they were cut or showcasing the unique grain of spalted wood. Technically these are face grain boards, but they are often more expensive because of the unique quality of the wood and the care with which it has been finished. 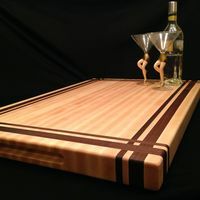 But serving boards may also be assembled using edge grain or end grain construction. 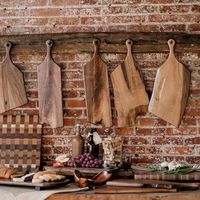 Many woodworkers use the small blocks of wood left over from larger construction projects to avoid waste and create stunning serving boards from the salvaged materials. Decorative boards can certainly be used as durable cutting surfaces, but are often used for serving breads, cheeses, sushi, and more. In a category all its own, live edge cutting and serving boards showcase the intrinsic beauty of a wood slab. These pieces feature slices of wood that retain the raw edges of the tree or branch from which they are sliced, rather than being squared off into perfectly symmetrical lumber. As a result, each piece is unique. An artisan will ensure that the piece is oiled and finished to reveal the beauty of the wood grain.